Once you have invested time and money in the golf cart of your dreams, the last thing you want is to have it damaged by the elements. We recommend storage covers to all our customers. With our complete line of storage covers, your golf cart will be protected against everything Mother Nature can throw its way. Whether you need a universal cover for a 2, 4, or 6-passenger golf cart, we have what you need. The majority of our covers have zippers that make them easy to set up and take down. Most also have a drawstring on the bottom that help to secure placement and maximize protection. Our most popular covers are our gray storage covers, which tend to show less dirt. Covers also keep your cart cool no matter the season or how sun-exposed your cart may be. All of our golf cart covers are UV ray resistant, so you won't have to sit on a hot seat. They're also weather-resistant, so you can rest assured that your golf cart will remain in the best possible condition over many years. 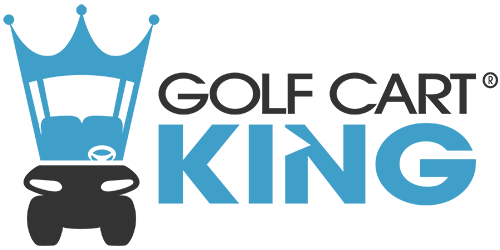 Golf Cart King has the best selection of covers and other golf cart accessories at the lowest possible prices. Take a look around and see for yourself. Universal Golf Cart Storage Cover for Two Person Carts with Tops 57" - 61"